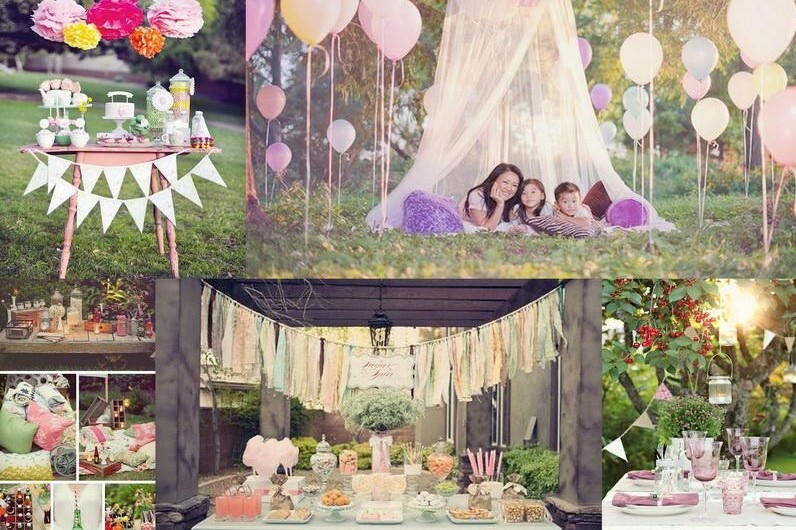 Now that the weather is heating up the outdoors are filling with color you may want to start planning a spring or summer event. The days will be longer and the parties will go later, whatever you are planning it is bound to be an all out blast. Here are some simple steps that will help you as you plan your outdoor event. There are many other helpful tips to guide you in your party planning, here are the links: Event Planning Tips, Creative Event Music, Saving Money. Now, on to the main event! Outdoor Décor: The first thing you should decide is what time of day your event will be held. If you are going to have an afternoon party you will want to check that there is adequate shelter from both the sun and unexpected weather. Party tents can be rented with relative ease but you can also arrange umbrellas in an unobtrusive way to provide protection and style. If the party is an evening event than lighting will be necessary, candles, string lights and outdoor lamps are great options, hurricane lamps are an excellent as well because their flame is protected from potential wind. Choose a color scheme that compliments the area/theme of the party and try to stick with it. Use these colors for of your decorations, accessories and even your food and beverages if possible. Don’t use one flat color, vary the shade and layer it throughout your event area. · Planting succulents or other attractive flora that can serve as centerpieces or accents. · Making use of retro lanterns and other various vintage camping accessories will add a rustic feel. · If you are looking for something more modern you can swap out rustic illumination for Chinese lanterns or LED lighting. · Burlap is very popular this year and it makes for cute and homey décor, not only that, it’s relatively cheap too. · Include attractive throw pillows with your lawn furniture to add comfort and a splash of color. As you’re decorating remember that you do not need to make it over the top, nature is doing half of the work for you. Make the decoration practical; use simple accents that enhance the surrounding not drown them out. Food: If you are hosting a cozy event with a lighter theme you will want to provide good ol’ fashioned comfort food. Everyone loves a backyard BBQ but you can also add more nostalgic item with modern flair. Whatever it is you are serving, be sure that it is easy to serve, eat, and carry. It’s likely that your guests will want to wander as they eat and even if they stay put there may be limited luxury seating or wind. See that whatever you serve is not only good but easy to maintain like finger-foods, try to avoid things that easily spill, and stain. Cleaning Tips: Pick an out-of-the-way space that can be used as your “sanitation station”. Just like professional caterers you can have a clean-up area to avoid clutter and make clearout faster and unseen.